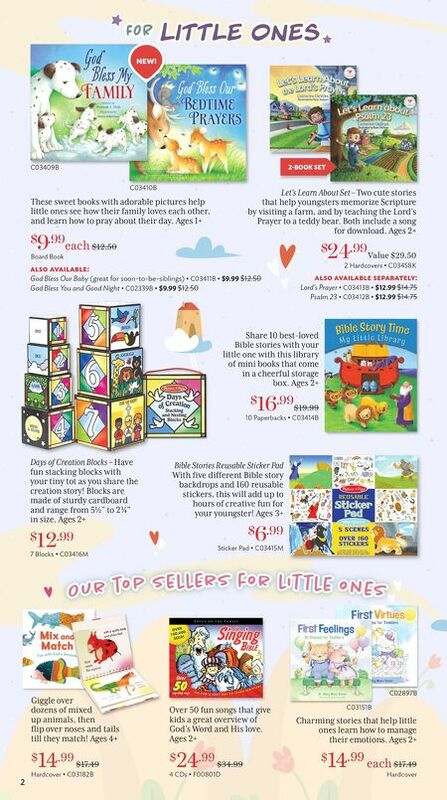 3 Shop online at shop.focusonthefamily.ca or call 1.800.661.9800 End your sleepyhead's day with this cute story about a boy whose toys sing him a lullaby to help him get to sleep. Pair it with the CD to hear the lullaby, plus 14 more, from Michael W. Smith. Ages 1+ Monster Truck Set – Meteor and his monster truck friends roll over jumps and splash through gunk while teaching kids lessons about kindness, forgiveness, helpfulness and more. Ages 2+ $ 21 .99 Value $25.98 2 DVDs • C03460K Scaredy cat is afraid of the silliest things! His fun story is a helpful entry point for talking to kiddos about fear and worry, and helping them to trust God. Ages 4+ $ 15 .99 $21.00 Hardcover • C03375B Youngsters are always in motion! This colourful board book taps into all that energy, helping them memorize Psalms through movement and actions. 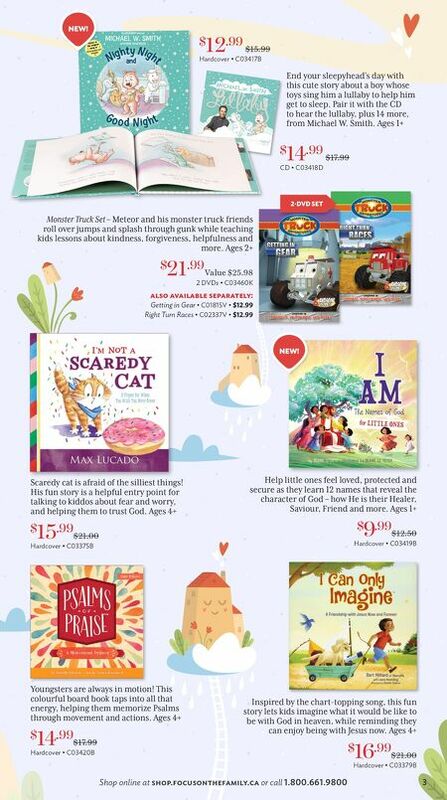 Ages 4+ $ 14 .99 $17.99 Hardcover • C03420B Help little ones feel loved, protected and secure as they learn 12 names that reveal the character of God – how He is their Healer, Saviour, Friend and more. Ages 1+ $ 9 .99 $12.50 Hardcover • C03419B Inspired by the chart-topping song, this fun story lets kids imagine what it would be like to be with God in heaven, while reminding they can enjoy being with Jesus now. Ages 4+ $ 16 .99 $21.00 Hardcover • C03379B also available separately: Getting in Gear • C01815V • $12.99 Right Turn Races • C02337V • $12.99 $ 14 .99 $17.99 CD • C03418D $ 12 .99 $15.99 Hardcover • C03417B 2-DVD SET NEW! NEW!